Dev Anand, Dilip Kumar, and Raj Kapoor, were the first three superstars of Hindi cinema, before there were superstars. Each was born within a couple of years of each other (Dev Anand in 1923, Raj Kapoor in 1924, and Dilip Kumar in 1922), each started his career around the same time (Dev Anand in 1946, Raj Kapoor in 1943, Dilip Kumar in 1946), and while Raj Kapoor died in 1988, and Dilip Kumar has been in retirement for more than a decade (his last movie if I remember was Qila in 1998 or thereabouts), Dev Anand continues to go strong, acting in and directing a movie every few years for over six decades now, the latest one released in 2005. Dev Anand had the screen persona of a dashing, evergreen, ever youthful happy-go-lucky city chap, with a legion of a mostly female fan following. Even in real life he has carried himself with the same elan, and at 85 years is an inspiration for many people. 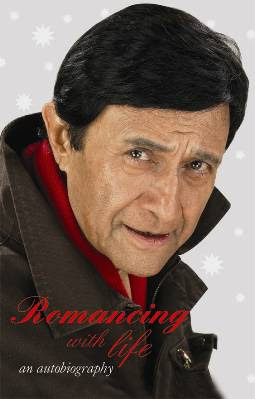 The book is a celebration of Dev Anand's (Dharam Dev Anand is his full name, as he informs us in the book) life and times, and his romance with life. It proceeds in pretty much a chronological fashion, starting with his childhood and ending with the year 2007, when the last chapter was written. It is written in breezy and mostly frank and honest style. Whether it is his sexual education, on the upper berth of a train, and then while shooting for his first movie, whether his struggles to find a footing in the Hindi movie industry, or his encounters with the censor authorities, or his crush for Zeenat Aman, or his first love with Suraiya, and the heartbreaking end to the affair, or his visit to communist Soviet Union, he comes across as refreshingly honest. The book is divided into numbered chapters, each small. Sometimes only a couple of pages, but rarely more than 4-5 pages. Each chapter covers a specific episode. So you get one chapter each for Guru Dutt, Kisore Kumar, his brother Vijay Anand, Indira Gandhi, Mahatma Gandhi, Pandit Nehru, Rajiv Gandhi... with a brief reminiscence by Dev. The language is quite decent in the book, the prose is fairly engaging, perhaps a result of Dev Anand's Lahore Government College education (then one of the most prestigious educational institutions in the country in the then undivided India, pre-Aug 14/15 1947), or maybe Dev Anand got a ghost writer to spruce up the text. Surprisingly, and refreshingly so, the book has a fairly comprehensive 12 page index, something you would not expect from a movie star's autobio. However... while the book 400+ page book makes for quick and easy reading, it has shortcomings too. You will learn nothing of the craft of film making from reading this book. You will learn nothing about the great movies that Dev Anand starred in. Whether Dev Anand's collaboration with the great director and actor and close friend Guru Dutt (Jaal and Baazi), nor the fantastic musical collaboration with SD Burman, nor the immense contributions of Chetan Anand and Vijay Anand (both brothers of Dev Anand) in such movies as 'Tere Ghar Ke Samne', 'Guide', 'Johny Mera Naam', 'Jewel Thief', 'Kala Bazar', 'Nau Do Gyarah'. You have to go through Dev Anand's filmography at the end of the book to realize that Raj Khosla had directed Dev Anand in some past greats like 'Bombai Ka Babu', 'Kala Pani', 'CID', and 'Solva Saal'. What made the great movies that Dev Anand starred in great? Why is it that Dev Anand did not have a single truly commercial or artistically acclaimed hit after he started directing his movies? Consider these truly unremarkable ventures like 'Ishq Ishq Ishq', 'Sau Crore ', 'Awwal Number', 'Gangster', 'Mr Prime Minister', 'Censor', 'Lootmaar' that Dev Anand directed and starred in? What were the lessons that Dev Anand learn from these disasters? Introspection? No. He acknowledges that 'Ishq Ishq Ishq' was one of the biggest disasters of his career. Why? You don't know. Perhaps the style of his book can be summed up with a line from his movie, Hum Dono: "barbadiyon ka shog manana fizool tha, barbadiyon ka jashn manata chala gaya" (loosely and inarticulately translated as 'lamenting disasters was a waste, I celebrated disasters').